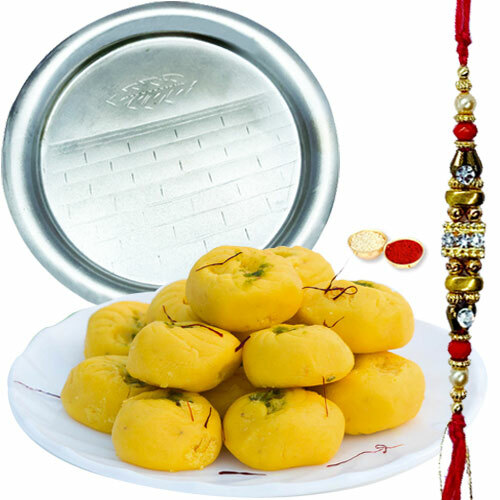 Deck the beautiful relation you share with your siblings and dear ones by sending them this Irresistible Gift of Mouth Watering Haldirams Pedas with Sprinkled Kesar and Delicate Pooja Thali on Raksha Bandhan, that comes with a free Rakhi, Roli Tilak and Chawal. The gross weight of the Kesar Pedas is 250 Gms and the size of the Thali is 7 to 8 inches. The pattern of the Rakhi may comes with variations depending on the availability.